Me and Monte on nb Pea Green. Welcome to my canal art website. Here you will find information about my hand-painted canal art, pictures of recent work and details on how to order. 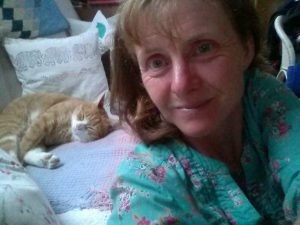 My blog includes tales about me, my narrowboat Pea Green and my ginger cat Montefiore Montague – aka Monte Moo. 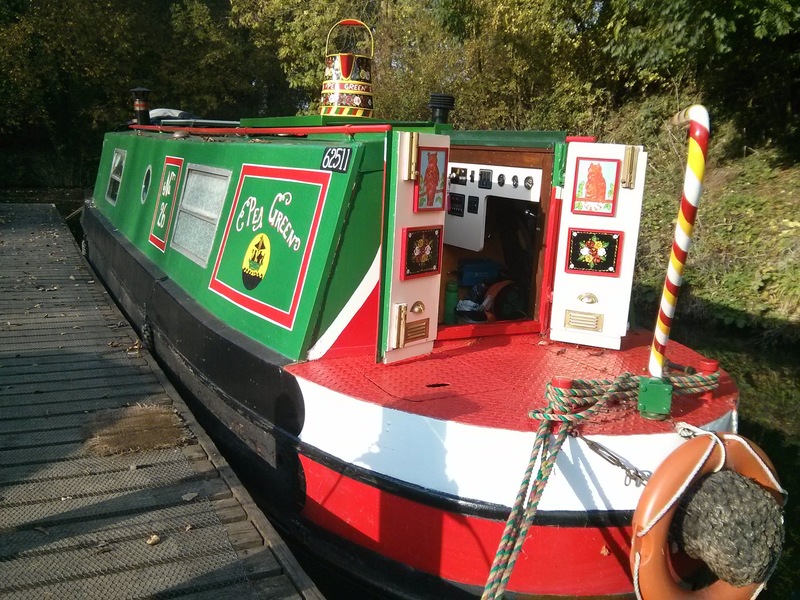 As a Canal and River Trust roving trader I paint, advertise and sell from narrowboat. 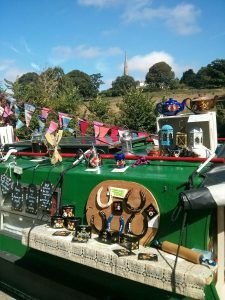 I am moored at Welford and am often found trading on the Welford Arm, Grand Union Canal on the Northamptonshire/Leicestershire border. I decorate all sorts of objects with traditional canal-art roses and daisies. I also personalise many items – from miniature roses and messages on horseshoes, to large Buckby cans. My folk art pieces have been bought as souvenirs as well as gifts and have ended up across the world. (One teapot is now on Norfolk Island in the South Pacific.) 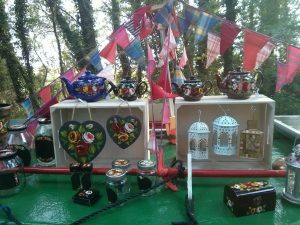 Although some of my work is now living on narrowboats many pieces have been bought for display and use in houses. 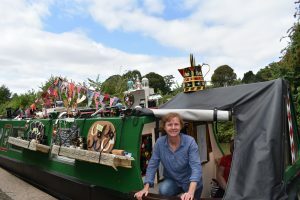 Roving trader – work displayed on my boat 2018. I paint a wide range of other items with canal art roses and daisies. Decorated slates with quotes extolling home, gin and cake have proved popular along with slate coasters. Usable wooden kitchenware (wooden spoons and rolling pins), beautiful teapots and blank greetings cards mean there is something for everyone. Occasionally I come across other interesting things to paint, galvanised buckets, old watering cans or interesting boxes to name but a few. I also paint a range of up-cycled jars. If you have items you would like to have painted, please do message me and we can discuss your requirements. It probably won’t cost that much! My recent commissions have included large Buckby cans, tilly lanterns, planters and a kitchen towel holder. I have also painted panels for boat doors. My Instagram feed – on this page- shows all my most recent pieces. A hard working craft group learning to paint canal art. 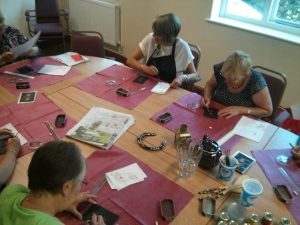 As my painting develops I have also started teaching craft-sessions to local groups. If you are interested in a painting session or a talk about canal art and the canals more generally, please do contact me. Finally, thank you for visiting, please do browse my pages and contact me (details below) if you would like to place an order. I also welcome comments on my blog posts. To order contact me via email, Facebook, Instagram or Twitter. I usually respond within a couple of hours. If the item is in stocks I can usually post within 24 hours. When it comes to payment I accept PayPal or can message you my bank details for BACS. I try to list postage/packing cost on my pages, and am of course happy to combine postage. As a rough guide a shoe-box size parcel is £3, a larger/heavier box is £5.50. You are also more than welcome to collect items, by prior arrangement, from nb Pea Green at Welford, Northants.